Ariel’s Point is a must see place to go if you want to transform you ordinary vacation into a fun and unforgettable one. It is a perfect daytime activity for adventure seekers out there. 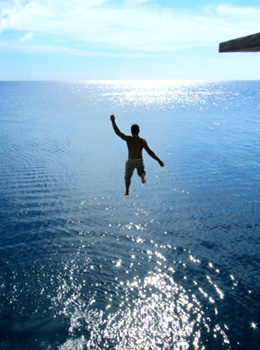 It has five cliff-jumping sites overlooking the spectacular turquoise blue water. Ariel’s Point is a banka boat ride away from Boracay Island to a place called Buruanga, western tip of mainland, Panay and still part of Aklan. Whether you choose to leap off and go cliff diving Ariels Point, paddle in a native canoe, or snorkel to a sandy beach, and or just trek around the garden grottos overlooking mangrove forests and more rock formations, it is a guaranteed exciting activity for everyone. Enjoy your cliff diving at Ariel’s and have a picnic of mouth-watering BBQ seafood buffet for lunch and an overflowing stock of soft drinks and beers. I am no longer positive where you are getting your information, but great topic. I must spend some time studying more or understanding more. Thank you for magnificent info I was looking for this info for my mission. What’s up mates, its great piece of writing about culture and fully explained, keep it up all the time. This entry was posted on Sunday, February 19th, 2012	at 3:25 pm	and is filed under Recent	. You can follow any responses to this entry through the RSS 2.0	feed. You can skip to the end and leave a response. Pinging is currently not allowed.